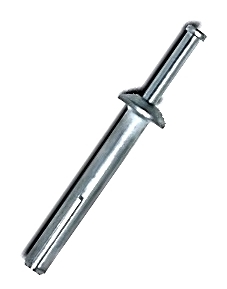 PRODUCT: 1/4" X 1-1/2" HAMMER NAILIN ANCHOR, STAINLESS STEEL PIN, MUSHROOM HEAD ZAMAC BODY. 100/BOX. PRICE/BOX. APPLICATIONS: Concrete, block, brick or stone. INSTALLATION: Use a carbide tipped masonry drill sized slightly larger than nominal diameter to allow clearance. A 1/4" masonry drill is frequently actually sized .260 to .268". #14 ID x 5/8 Inch OD 316 Stainless Steel Sealing Washer. 20 Gauge 316 Stainless Steel with Bonded EPDM Rubber Seal. Tightly fits & seals 1/4 inch and #14 threaded fasteners. 1000/Box. Price/Box. 1/4 In. I.D. x 1-1/8 In. O.D. 304 Stainless Steel Sealing Washer. EPDM Rubber Bonded to 20 Gauge 304 Stainless Steel Washer. 100/Bag. Price/Bag.